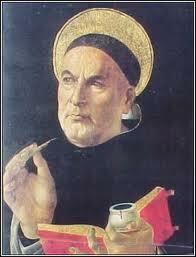 Perhaps the most famous of all the Dominican saints, today is the feast day of St. Thomas Aquinas. Thomas was born in Roccasecca circa 28 January 1225, in the castle of his father, Count Landulf of Aquino, in Roccasecca, from which the great Benedictine abbey of Montecassino is not quite visible, midway between Rome and Naples, in what is now Sicily. Through his mother, Theodora, Countess of Theate, Thomas was related to the Hohenstaufen dynasty of Holy Roman emperors. His family was related to the Emperors Henry VI and Frederick II, and to the Kings of Aragon, Castile, and France. Calo relates that a holy hermit foretold his career, saying to Theodora before his birth: “He will enter the Order of Friars Preachers, and so great will be his learning and sanctity that in his day no one will be found to equal him.” Landulf’s brother, Sinibald, was abbot of the original Benedictine abbey at Monte Cassino. While the rest of the family’s sons pursued a military career, Thomas was intended to follow his uncle into the abbacy; this would have been a normal career path for the younger son of southern Italian nobility. At the age of five, Thomas began his early education from the Benedictine monks at Monte Cassino. Diligent in study, he was thus early noted as being meditative and devoted to prayer, and his preceptor was surprised at hearing the child ask frequently: “What is God?”However, after a military conflict broke out between the Emperor Frederick II and Pope Gregory IX spilled into the abbey in early 1239, Landulf and Theodora had Thomas enrolled at the University of Naples, which had been recently established by Frederick. At Naples his preceptors were Pietro Martini and Petrus Hibernus. The chronicler says that he soon surpassed Martini at grammar, and he was then given over to Peter of Ireland, who trained him in logic and the natural sciences. The customs of the times divided the liberal arts into two courses: the Trivium, embracing grammar, logic, and rhetoric; the Quadrivium, comprising music, mathematics, geometry, and astronomy. Thomas could repeat the lessons with more depth and lucidity than his masters displayed. The youth’s heart had remained pure amidst the corruption with which he was surrounded, and he resolved to embrace the religious life. It was here that Thomas was introduced to the words of Aristotle, Averroes and Maimonides, all of which would later influence his theological philosophy. It was also during his studies in Naples that Thomas came under the influence of John of St. Julian, a Dominican preacher in Naples, who was part of the active effort by the Dominican order, which had only recently been established, to recruit devout followers. At the age of nineteen, Thomas resolved to join the Dominican Order. Thomas’s decision to do so did not please his family, who had expected him to become a Benedictine monk. Some time between 1240 and August, 1243, he received the habit of the Order of St. Dominic, being attracted and directed by John of St. Julian, a noted preacher of the convent of Naples. The city wondered that such a noble young man should don the garb of poor friar. His mother, with mingled feelings of joy and sorrow, hastened to Naples to see her son. In an attempt to prevent Theodora’s interference in Thomas’s choice, the Dominicans arranged for Thomas to be removed to Rome, and then to Paris. However, on the way to Rome, his brothers who were soldiers under the Emperor Frederick, following their mother’s instructions, seized him as he was drinking from a spring near the town of Aquapendente and took him back to his parents, who were then at the castle of Monte San Giovanni Campano. He was held for in the family homes at Monte San Giovanni and Roccasecca in an attempt to prevent him from assuming the Dominican habit, and to convince him to become a Benedictine. Political concerns prevented the Pope from ordering Thomas’s release, which extended his detention, during which he spent tutoring his sisters and communicating with members of the Dominican Order. Family members became desperate to dissuade Thomas, who remained determined to join the Dominicans. At one point, two of his brothers hired a prostitute to seduce him, but he drove her away, wielding a burning stick. According to legend, that night two angels appeared to him as he slept and strengthened his resolve to remain celibate. Thomas immediately pronounced his vows, and his superiors sent him to Rome. Innocent IV examined closely into his motives in joining the Friars Preachers, dismissed him with a blessing, and forbade any further interference with his vocation. In 1245, Thomas was sent to study at the University of Paris’s Faculty of Arts where he met Dominican scholar Albertus Magnus, then Chair of Theology at the College of St. James. The theological program Thomas entered in Paris was a grueling one, with the master’s typically attained in the early thirties. Extensive and progressively more intensive study of the scriptures, Old and New Testament, and of the summary of Christian doctrine called the Sentences which was compiled by the twelfth century Bishop of Paris, Peter Lombard. These close textual studies were complemented by public disputations and the even more unruly quodlibetal questions. With the faculty modeled more or less on the guilds, Thomas served a long apprenticeship, established his competence in stages, and eventually after a public examination was named a master and then gave his inaugural lecture. Thomas taught in Cologne as an apprentice professor, instructing students in the books of the Old Testament and writing Expositio super Isaiam ad litteram (Literal Commentary on Isaiah), Postilla super Ieremiam (Commentary on Jeremiah), and Postilla super Threnos (Commentary on Lamentations). Then in 1252, he returned to Paris to study for a master’s degree in theology. He lectured on the Bible as an apprentice professor, and upon becoming a baccalaureus Sententiarum (bachelor of the Sentences); he devoted his final three years of study to commenting on Peter Lombard’s Sentences. In the first of his four theological syntheses, Thomas composed a massive commentary on the Sentences entitled Scriptum super libros Sententiarium (Commentary on the Sentences). Aside from his master’s writings, he wrote De ente et essentia (On Being and Essence) for his fellow Dominicans in Paris. In the spring of 1256, Thomas was appointed regent master in theology at Paris, and one of his first works upon assuming this office was Contra impugnantes Dei cultum et religionem (Against Those Who Assail the Worship of God and Religion), defending the mendicant orders which had come under attack by William of Saint-Amour. During his tenure from 1256 to 1259, Thomas wrote numerous works, including Questiones disputatae de veritate (Disputed Questions on Truth), which was a collection of twenty-nine disputed questions on aspects of faith and the human condition and which was prepared for the public university debates he presided over on Lent and Advent. He also wrote Quaestiones quodlibetales (Quodlibetal Questions), a collection of his responses to questions posed to him by the academic audience; and both Expositio super librum Boethii De trinitate (Commentary on Boethius’s De trinitate) and Expositio super librum Boethii De hebdomadibus (Commentary on Boethius’s De hebdomadibus), commentaries on the works of 6th century philosopher Anicius Manlius Severinus Boethius. By the end of his regency, Thomas was working on one of his most famous works, Summa contra Gentiles. Around 1259, Thomas returned to Naples where he lived until he went to in Orvieto in September 1261. In Orvieto, he was appointed conventual lector, in charge of the education of friars unable to attend a studium generale. During his stay in Orvieto, Thomas completed his Summa contra Gentiles, and wrote the Catena Aurea (The Golden Chain). He also wrote the liturgy for the newly created feast of Corpus Christi and produced works for Pope Urban IV concerning Greek Orthodox theology, e.g. Contra errores graecorum (Against the Errors of the Greeks). In 1265 he was ordered by the Dominican Chapter of Agnani to establish a studium for the Order in Rome at the priory of Santa Sabina. He remained there from 1265 until he was called back to Paris in 1268. It was while in Rome that Thomas began his most famous work, Summa Theologica, and wrote a variety of other works, such as his unfinished Compendium Theologiae and Responsio ad fr. Ioannem Vercellensem de articulis 108 sumptis ex opere Petri de Tarentasia (Reply to Brother John of Vercelli Regarding 108 Articles Drawn from the Work of Peter of Tarentaise). In his position as head of the studium, he conducted a series of important disputations on the power of God, which he compiled into his De potentia. In 1268 the Dominican Order assigned Thomas to be regent master at the University of Paris for a second time, a position he held until the spring of 1272. Part of the reason for this sudden reassignment appears to have arisen from the rise of “Averroism” or “radical Aristotelianism” in the universities. “Averroisms” was the belief that there is no God, that the soul has two parts, one individual and one eternal; the world is eternal; the soul is not eternal. (During this period in history, Averroism was virtually synonymous with atheism.) In response to these perceived evils, Thomas wrote two works, one of them being De unitate intellectus, contra Averroistas (On the Unity of Intellect, against the Averroists) in which he blasts Averroism as incompatible with Christian doctrine. During his second regency, he finished the second part of the Summa and wrote De virtutibus and De aeternitate mundi, the latter of which dealt with controversial Averroist and Aristotelian beginninglessness of the world. Disputes with some important Franciscans such as Bonaventure and John Peckham conspired to make his second regency much more difficult and troubled than the first. A year before Thomas re-assumed the regency at the 1266–67 Paris disputations, Franciscan master William of Baglione accused Thomas of encouraging Averroists, calling him the “blind leader of the blind”. Thomas called these individuals the murmurantes (Grumblers). In reality, Thomas was deeply disturbed by the spread of Averroism and was angered when he discovered Siger of Brabant teaching Averroistic interpretations of Aristotle to Parisian students. On 10 December 1270, the bishop of Paris, Etienne Tempier, issued an edict condemning thirteen Aristotlelian and Averroistic propositions as heretical and excommunicating anyone who continued to support them. Many in the ecclesiastical community, the so-called Augustinians, were fearful that this introduction of Aristotelianism and the more extreme Averroism might somehow contaminate the purity of the Christian faith. In what appears to be an attempt to counteract the growing fear of Aristotelian thought, Thomas conducted a series of disputations between 1270 and 1272: De virtutibus in communi (On Virtues in General), De virtutibus cardinalibus (On Cardinal Virtues), De spe (On Hope). In 1272 Thomas took leave from the University of Paris when the Dominicans from his home province called upon him to establish a studium generale wherever he liked and staff it as he pleased. He chose to establish the institution in Naples, and moved there to take his post as regent master. He took his time in Naples to work on the third part of the Summa while giving lectures on various religious topics. On 6 December 1273 Thomas was celebrating the Mass of St. Nicholas when, according to some, he heard Christ speak to him. Christ asked him what he desired, being pleased with his meritorious life. Thomas replied “Only you Lord. Only you.” After this exchange something happened, but Thomas never spoke of it or wrote it down. Because of what he saw, he abandoned his routine and refused to dictate to his secretary, Reginald of Piperno. When Reginald begged him to get back to work, Thomas replied: “Reginald, I cannot, because all that I have written seems like straw to me,” And he seemed to be seriously ill. What exactly triggered Thomas’s change in behavior is believed to be some kind of supernatural experience of God. After taking to his bed, he did, however, recover some strength. Looking to find a way to reunite the Eastern Orthodox churches with the Catholic Church (the Eastern Orthodox were excommunicated by the Roman Catholic Church in A.D. 1054 over doctrinal disputes) Pope Gregory X convened the Second Council of Lyon to be held on 1 May 1274 and summoned Thomas to attend. At the meeting, Thomas’s work for Pope Urban IV concerning the Greeks, Contra errores graecorum, was to be presented. On his way to the Council, riding on a donkey along the Appian Way, he struck his head on the branch of a fallen tree and became seriously ill again. He was then quickly escorted to Monte Cassino to convalesce. After resting for a while, he set out again, but stopped at the Cistercian Fossanova Abbey after again falling ill. The Cistercian monks of Fossa Nuova pressed him to accept their hospitality, and he was conveyed to their monastery, on entering which he whispered to his companion: “This is my rest for ever and ever: here will I dwell, for I have chosen it” (Psalm 131:14). The monks nursed him for several days, and as he received his last rites, he prayed: “I receive Thee, ransom of my soul. For love of Thee have I studied and kept vigil, toiled, preached and taught…” He died on 7 March 1274. When the devil’s advocate at his canonization process objected that there were no miracles, one of the cardinals answered, “Tot miraculis, quot articulis“—”there are as many miracles (in his life) as articles (in his Summa).” Fifty years after the death of Thomas, on 18 July 1323, Pope John XXII, seated in Avignon, pronounced Thomas a saint. In a monastery at Naples, near the cathedral of St. Januarius, a cell in which he supposedly lived is still shown to visitors. His remains were placed in the Church of the Jacobins in Toulouse in 1369. Between 1789 and 1974, they were held in Basilique de Saint-Sernin, Toulouse. In 1974, they were returned to the Church of the Jacobins, where they have remained ever since. In the General Roman Calendar of 1962, in the Roman Catholic Church, Thomas was commemorated on 7 March, the day of death. However, in the General Roman Calendar of 1969, even though the norm in the Roman Catholic Church is to remember saints on the day of their death, Thomas’s memorial was transferred to 28 January, the date of the translation of his relics to Toulouse. Saint Thomas Aquinas is honored with a feast day on the liturgical of the Episcopal Church in the United States of America on 28 January.